KIMBALL, Tenn.(April 16, 2011) - Emotions ran high today as the 2011 Federation National Championship presented by the National Guard came to a dramatic close. The Chattanooga Convention Center housed the main event and a lively crowd grew still as each weight was settled and the fates of the 14 hopeful TBF anglers hung in the balance. All 14 Division Champions earned berths to the 2011 Walmart BFL All-American presented by Chevy in Shreveport, La., May 19-21, and the national champions qualified for the prestigious Forrest Wood Cup presented by Walmart. But today it was all about naming the national champions and it literally came down to ounces. Allen Boyd and Rhett Fornoff emerged victorious. 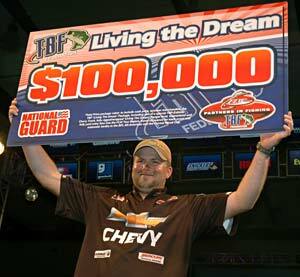 Allen Boyd, the champion boater, walked away with the $100,000 “Living the Dream” prize package that includes cash, fully paid entry fees to the Walmart FLW Tour as a pro, use of a custom “Living The Dream” wrapped Chevy Truck and wrapped Ranger Boat on Tour for the year and a travel stipend for each event. 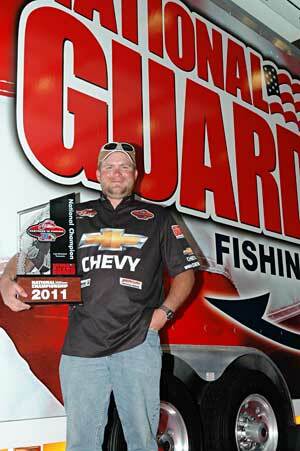 He will also be fishing the 2011 Forrest Wood Cup in Hot Springs, Ark., in August. Boyd, from Salem, Ind., was 13th overall after day one and just third in his division. On day two a good bag and a 6-pound, 6-ounce beauty helped him creep up to third overall and command the lead in his division. Today, Boyd came out guns flaring with a consistent game plan that clearly paid off. Kenny Beale from Virginia, who represented the Mid-Atlantic Division, was leading the first two days of the tournament. He came up a little short to win the “Living the Dream” prize package, but he didn’t quite end up empty handed. 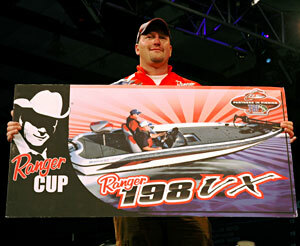 Beale was the highest finishing Ranger Cup qualifier and won a brand new Ranger 198VX. Rhett Fornoff of Park City, Utah, was victorious on the co-angler side, making him the 2011 TBF Co-Angler Champion, plus the Ranger Cup bonus of $5,000 cash for registering with the Ranger Cup contingency program. 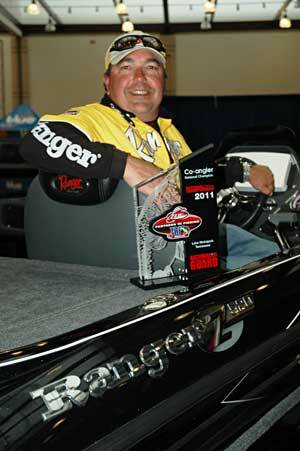 The victory also earns him a berth into the 2011 All-American and the 2011 Forrest Wood Cup as a co-angler.